March 2019 -- Over the past 25 years or so, there has been a growing body of evidence to demonstrate that the ancient world was extremely colorful (certainly much more brilliantly decorated than Renaissance scholars would have liked us to believe). Everything from the Parthenon to Greek and Roman statues and now to the interiors of Assyrian palaces were vibrantly colored. We make no judgments about ancient taste, but the polychromatic nature of ancient cities changes our perception of the past. Learning Sites has re-evaluated the decorative design scheme of the Northwest Palace at Nimrud and devised, based on detailed analysis of excavation notebooks, field reports, and chemical studies of paint, a dramatically new envisioning of the palace interiors (primarily the throne room, and several other spaces throughout the palace). Individual carved bas reliefs have also been reimagined, as can be seen below (a winged genius from Room S, the king's reception room in his private suite). January 2019 -- Learning Sites will begin a new project to reconstruct the Iron Age (c.700 BCE) sanctuary and surrounding settlement at Tell Damiyah, Jordan. The massive mound, which rises 17m from the surrounding valley floor, is currently being excavated by a joint team from the National Museum of Antiquities in Leiden (Netherlands) and Yarmouk University in Irbid (Jordan). The Iron Age remains so far uncovered include several buildings, one most likely a temple, and many diagnostic artifacts, from figurines to pottery stands and bullae. The project will entail extensive use of photomodeling, virtual reality, and interactive databases. Be sure to watch for the project homepage as the models progress. 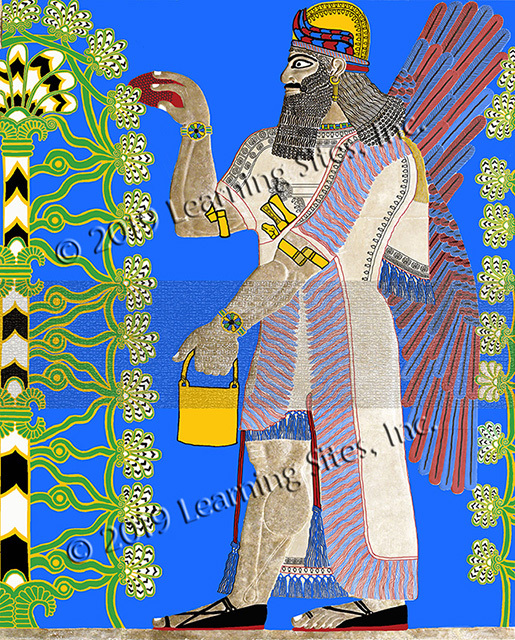 October 2018 -- Learning Sites has begun two new projects (with the Carlos Museum at Emory University and the Virginia Theological Seminary) involving new videos showcasing our existing Assyrian palaces at Nimrud and Nineveh. For the Carlos Museum, we will be flying over and then through the Southwest Palace of Sennacherib (his so-called Palace without Rival. The video will feature new furnishings, floor coverings, animated characters, and dynamic lighting as the camera moves into one of the inner administrative suites of the palace and into, believe it or not, a bathroom (most likely for one of the guards of that wing of the palace). The Carlos Museum will be displaying fragments of wall reliefs from that room; our video will show visitors the locational context of the room and the reliefs. For the Virginia Theological Seminary, we will be flying over and then through King Ashur-nasir-pal II's Northwest Palace at Nimrud. This video will move back into heretofore unmodeled inner private quarters of the king, to show the context of a relief on display in the Seminary. This video will feature, for the first time, an Assyrian queen, as well as other new features and furnishings. Watch the individual palace pages for updates as our models expand. January 2018 -- Donald H. Sanders, president of Learning Sites, will be giving a talk at the Rijksmuseum van Oudheden, Leiden (the Netherlands) at their conference Creating and Recreating Nineveh, January 22, 2018. Sanders topic will be virtual heritage and the work of Learning Sites, with special focus on their 3D modeling of ancient Nineveh. 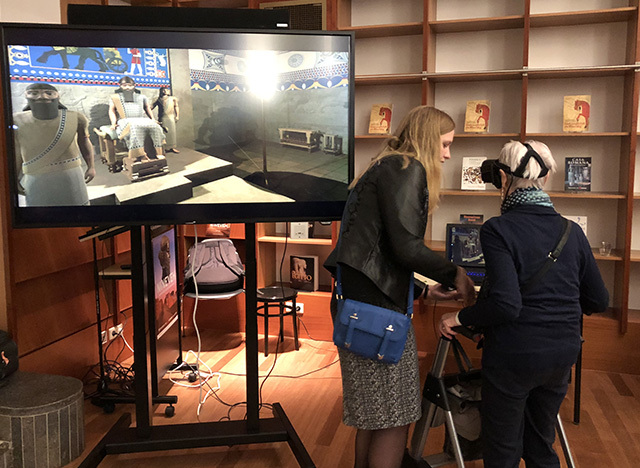 Sanders appearance at the conference will also include two OculusRift immersive virtual reality demonstrations, featuring Learning Sites digital reconstruction of the now-destroyed throne room from the Northwest Palace of King Ashur-nasir-pal II, at Nimrud (9th c. BCE). If you are in the neighborhood and have not yet experienced true virtual reality, stop by for a trip to the past. 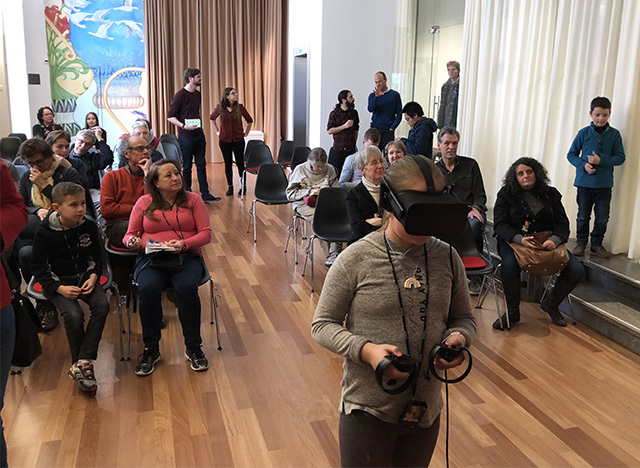 The events were both very well attended, with visitors waiting in line an hour before opening to don one of the two VR headsets and become immersed in ancient Assyria. Young and old revelled in the past, with over 100 participants across just 3.5 hours ! December 2017 -- Animated flyovers of Learning Sites' 3D computer model recreating the Northwest Palace of the Assyrian king Ashur-nasir-pal II, Nimrud (northeastern Iraq), is part of Harvard's Semitic Museum's videos celebrating their newest exhibition From Stone to Silicone: recasting Mesopotamian monuments. In a newly renovated gallery, the museum is displaying their large collection of plaster and resin casts of well-known Near Eastern sculpture. Many of their casts are replicas of Assyrian wall reliefs from the Northwest Palace; our 3D model visualizes the original contexts of these reliefs. November 2017 -- Learning Sites will have a display booth at this year's American Society of Oriental Research annual meeting, in Boston, Nov. 15-18, 2017. The booth will feature examples of our projects (new and old), 3D printed samples of artifacts, other cool stuff, and knowledgable members of the Learning Sites team. Stop by and we can show you how our innovative visualizations could benefit your hypothesis testing, teaching, publishing, museum display, or broadcast of archaeological evidence. October 2017 -- Donald H. Sanders, President, Learning Sites, Inc. and the Institute for the Visualization of History, will be part of a panel discussion on the digital reconstruction of the spoils panel from the Arch of Titus, Rome, to be held at a day-long symposium on October 29th at the Yeshiva University Museum, and jointly sponsored by the museum and the Yeshiva University Center for Israel Studies. Scholars from around the world will discuss the historical context and cultural significance of the Arch, with special focus on the spoils panel (when you click on the Yeshiva link above, be sure to follow their links to the university Website and then to Events, and then to the program for the symposium). September 2017 -- The Arch of Titus spoils panel was successfully installed in the Yeshiva University Museum Popper Gallery for their show on the arch. A grand opening gala was held on September 13. 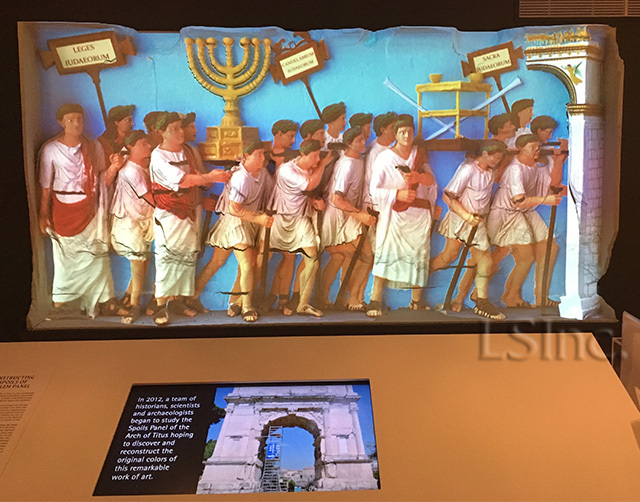 The highlight of the opening was the debut of the replica panel with our projected digital reconstruction of all the missing bits of the sculpture and then the colors the Romans used to display their relief (the images below show the replica with our projected overlays). August 2017 -- Learning Sites in partnership with Neathawk Designs will be hosting an Open House to celebrate the unveiling of the Arch of Titus spoils panel full-scale replica, before it gets shipped off for installation in the Yeshiva University Museum. Find out more about this event in the Berkshire Eagle and the Berkshire Trade & Commerce monthly (Sept. 2017: page 8). The event was a great success, as reported by iBerkshires. 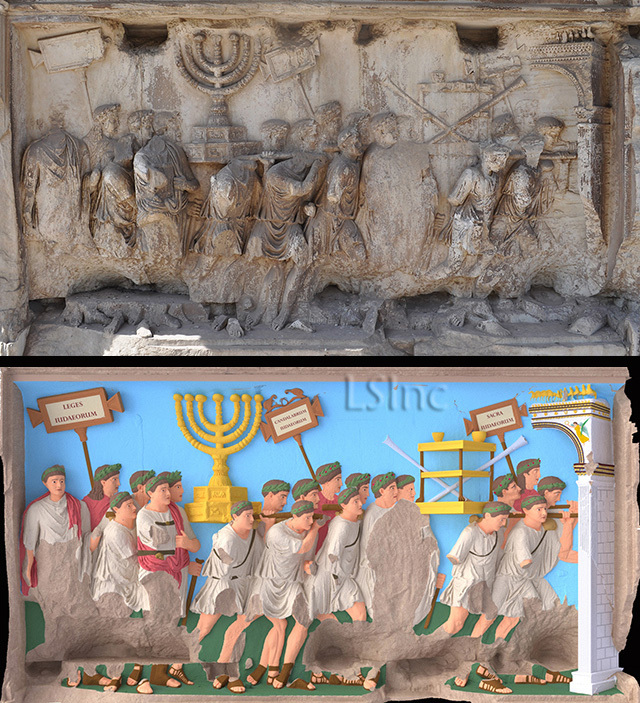 July 2017 -- Learning Sites has been contracted by the Institute for the Visualizstion of History to assist in the digital restoration and colorization of the spoils panel from the Arch of Titus, Rome; and partnered with Neathawk Designs to create a full-scale replica of the current relief. The replica will be hung in the Popper Gallery of the Yeshiva University Museum for their exhibtion The Arch of Titus – from Jerusalem to Rome, and Back set to open in September 2017. 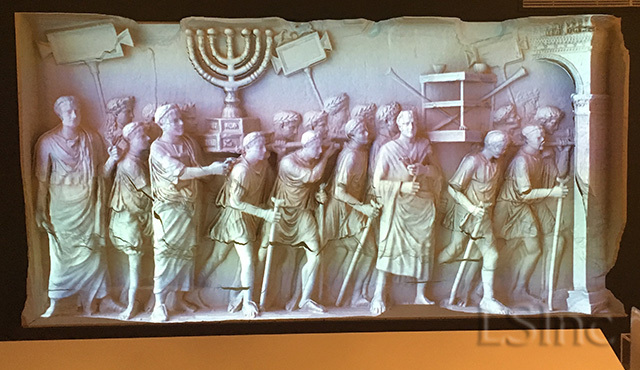 The fully colorized and restored digital image of the spoils panel will then be digitally projected onto the surface of the replica providing a heretofore unimagined glimpse into Jewish and Roman history (a photograph of the current state of the relief and a preliminary colorization can be seen below). This story has also been picked up by the Religion News Service and on Haaretz online. You can follow the progress of the project on our Arch of Titus homepage. April 2017 -- Learning Sites has licensed an OculusRift VR headset version of our Northwest Palace of Ashurnasirpal II, Nimrud, to Yale University for use in its classrooms and learning centers. This version features supplemental audio and image files linked to several features in the room (see image below), animated characters, and real-time lighting and smoke. April 2017 -- Further, Learning Sites has been contracted by the Rijksmuseum van Oudheden (National Museum of Antiquities) in Leiden, the Netherlands to provide a series of videos and renderings focusing on the ancient Assyrian capital city of Nineveh for their upcoming exhibition on the city. The show will open in October, 2017. Our visualizations will feature brand new 3D digital models of key architecture around the citadel and the lower city and updated models of existing structures. View our Nineveh pages for updated images as our work progresses. More about the exhibition can be found on the museum Website. 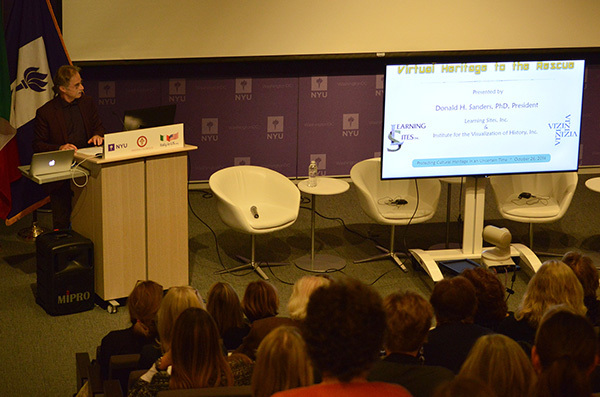 October 2016 -- Learning Sites president, Donald H. Sanders, spoke at the symposium entitled Protecting Cultural Heritage in an Uncertain Time, which took place at the New York University Brademas Center, Washington DC. The one-day gathering was attended by dignitaries, scholars, and students from around the world to discuss and learn about the loss of cultural heritage due to deliberate destruction and how to prevent it and preserve the past for the future. 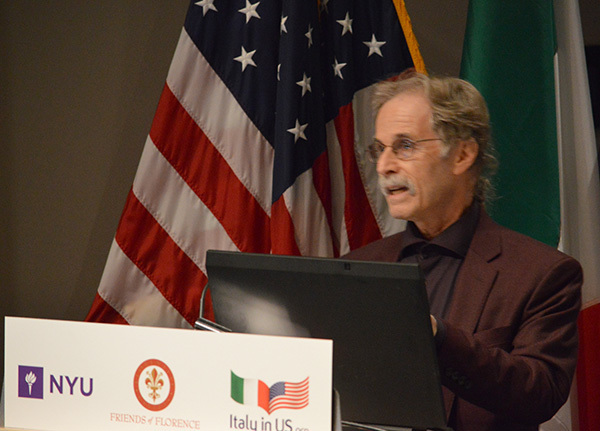 Sanders spoke on Learning Sites use of advanced digital technologies, including virtual reality, drone-based photomodeling, born digital documentation methods, and intelligent avatars for the recording, visualizing, teaching, and publishing information about the past (a full video transcript of the program plus a gallery of images is available at the conference Website; to listen to Sanders' talk, scroll down to Panel 2, scroll over to the 34:53 mark in the video, and then start the video). June 2016 -- Learning Sites president, Donald H. Sanders, spoke at Hevreh of Southern Berkshire (Great Barrington MA) on the subject: The Jewish People versus the Assyrians Kings: how virtual reality helps us understand and preserve what has now been lost. The talk touched on several projects underway at Learning Sites covering such topics as corroboration among biblical passages and ancient Assyrian texts, how virtual heritage provides new insight into the past, and how 19th-c. excavations in Mesopotamia profoundly changed our perceptions of biblical writings. For further information about the time and place of this event, see the Jewish Federation of the Berkshires Website. March 2016 -- Donald H. Sanders published an article on the benefits of a virtual heritage approach to the past: "The Present and Future of Virtual Heritage," in M. G. Micale & D. Nadali, eds. How Do We Want the Past to Be? On Methods and Instruments of Visualizing Ancient Reality. Piscataway NJ: Gorgias Press. Sanders discusses virtual heritage with examples of recent virtual heritage projects that led to new and sometimes unexpected insight into the past. He also outlines how other new digital technologies could have an impact on archaeological fieldwork, such as with the free and open-source REVEAL all digital excavation documentation and recording software package. January 2016 -- An article about the history of Learning Sites, the recent Tartessos Prize awarded to President Donald H. Sanders, and its current projects was written by John Townes and published in the Berkshire Trade & Commerce Monthly ("Lost & Found: Williamstown-based firm recognized for pioneering work in virtual heritage," v.19 #9:front page, 10-11, with numerous illustrations). The article emphasizes the importance of virtual reality and other digital visualization technologies especially in light of the wanton and willful destruction of cultural heritage by ISIS and how such images can play important roles in long-term preservation of fragile archaeological material. January 2016 -- This is an important event for anyone concerned about the loss of cultural heritage due to wanton destruction: The Future of the Past: Digitizing Cultural Property in an Era of Destruction. A symposium associated with the exhibition The Missing: Rebuilding the Past will be shown at the Anya and Andrew Shiva Gallery at the John Jay College of Criminal Justice, City University of New York. The symposium will be held on Friday, January 22, 2016, at 3-5 pm and will include a demonstration of the immersive virtual reality project, Nimrud Rising on Friday, January 22, from 1-3 pm, and Saturday, January 23, from 1-5 pm at the Shiva Gallery, John Jay College, with entrance at 860 11th Ave., New York City between 58-59th Streets. Learning Sites will be demonstrating (using an OculusRift VR headset) its immersive virtual reality re-creation of the recently dynamited Northwest Palace throne room at Nimrud, ancient Assyria (present day Iraq; see images below from the event). Nimrud Rising is a joint project with Cultural Capital and the Antiquities Coalition. You can learn more about the exhibit, the symposium, and our VR demo on the HyperAllergic review and in the story prepared by American Television News and on various blogs, e.g., by ASOR and by Bonnie J. Gordon. September 2015 -- Donald H. Sanders, president of Learning Sites, was a featured speaker at the 16th annual City of David Archaeological Conference, Jerusalem. The conference focused both on methods to combat purposeful destruction of cultural heritage sites and on recent discoveries in the City of David excavations. Sanders spoke on the value of 3D computer models and other digital recording and documentation systems as ways to ensure that destroyed archaeological treasures can live on, be studied, and serve as lessons for future generations. Examples from the links between ancient Assyrian sites and inscriptions of the 8th-7th centuries BCE and contemporary events along the eastern Mediterranean coast, based on Learning Sites interactive virtual worlds of Nimrud and Nineveh, illustrated that value. Reports about the conference can be read online from the Israel National News service, TheMediaOnline and the Israel Hayom and Jerusalem Post newspapers. Sanders' conference presentation has been published in the conference proceedings. August 2015 -- Learning Sites has been awarded a prestigious NSF SBIR Phase II TECP (Technology Enhancement for Commercial Partnerships) grant to expand the functionality of our CUNATTM cuneiform translator smartphone app in order to solve the problem of finding and identifying 2D characters, and then translating 2D texts, especially those written across curved or irregular surfaces for which traditional optical character recognition systems would be ineffective. More specifically, our partner, the Department of Egyptian Art at the Metropolitan Museum of Art (MMA) in NYC, has an overwhelming number of ancient labels in the form of short hieratic script texts found handwritten on the shoulders of pottery vessels that come from the excavations at Malqata (one of the few ancient Egyptian royal cities known). The nearly 1400 handwritten hieratic dockets found on large storage jars and amphoras identify their contents and the place delivering the provisions (such as the example pictured at the left). A significant urban site, Malqata was established by the pharaoh Amenhotep III in the 30th year of his reign (about 1360 BCE) when he celebrated his first heb-sed, a royal jubilee intended in part to rejuvenate the king. Continuing excavations by the MMA, which have the potential of uncovering more texts, combined with the limited personnel and time available by members of the field team and MMA staff to translate all of the labels, mean that these crucial written resources cannot be efficiently analyzed and published. Staff time and energy would be best spent studying the contents of the texts rather than on the tedious and labor-intensive job of translation. The results of the collaboration will provide new means to help translate, catalogue, and sort hieratic texts and speed these activities at ongoing excavations, make scholarly research much more effective, and provide new educational materials for fieldwork, thousands of museums, related collections, and schools worldwide. The short texts provide valuable information about the flow of goods to a pharaoh's festival, the number of scribes who worked on the texts, the types of goods coming to the celebration, and how such items were tracked during these special events--all of which would be new information and information that would otherwise take curators years to collocate and study. The hieratic module to the existing CUNAT app will allow new questions to be asked about the Egyptian texts (such as about their paleography--identifying scribal hands--and the economics of goods movement) that cannot now be posited based on traditional translation and publication methods. June 2015 -- A semester-long partnership between Learning Sites and students in the computer science department at the University of Illinois Champaign-Urbana has created a stunning repurposing of the throne room of the Learning Sites Northwest Palace, Nimrud, 3D model for the OculusRift VR headset. The immersive experience of the throne room was enhanced by adding interactivity to test new types of learning environments. Objects and features throughout the world now have links, activated by gaze, that trigger audio files describing the objects or features, and also bring up photographs and drawings to supplement the user's understanding of the linked objects (see the screen grab below, where one of the guardian animals has been highlighted and related images appear nearby). Other effects like real-time lighting and animated characters were also included. Both the course description and the resulting VR museum explanation with sample images are online. March-April 2015 -- The Berkshire Eagle newspaper (online and as the cover story to its Sunday March 29, 2015 paper) published an article on Learning Sites' virtual reality reconstructions of the citadel at Nimrud and the destruction at the site by ISIS/Da'esh. Could our digital models be the only remaining reminders of the greatness of ancient Assyrian culture to educate future generations? The article includes new renderings from our 3D computer model of the Northwest Palace, as well a discussion of the importance of continuing to develop digital surrogates of the world's treasures (the new rendering below is a view toward the throne). 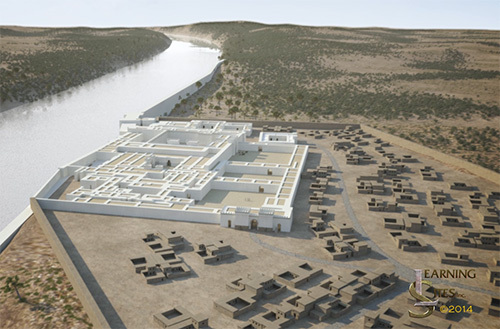 September 2014 -- Learning Sites created an animated flythrough of its 3D model of the Northwest Palace of King Ashur-nasir-pal II, Nimrud (Assyria, present-day Iraq), for the Metropolitan Museum of Art's (NYC) exhibition entitled From Assyria to Iberia: Crossing Continents at the Dawn of the Classical Age. Our animation has now been installed and will be open to the public beginning Sept. 22. For more information on the show, see: http://www.metmuseum.org/exhibitions/listings/2014/assyria-to-iberia). Our animation will be shown on a large screen monitor on a wall near the beginning of the show and near one of the museum's reliefs from the palace. Take and look and let us know what you think ! May 2014 -- Learning Sites' NSF-funded CUNATTM app project (see below August 2013) has created a video of its progress to date, a poster to explain the need for the approach, and set up a Website for discussion about future features, applications, and innovations. See www.translation-engine.com for further details. April 2014 -- Learning Sites signed a contract with the Metropolitan Museum of Art, NYC, to provide an animated flythrough of its 3D model of the Northwest Palace of King Ashur-nasir-pal II, Nimrud (Assyria, present-day Iraq), for the museum's upcoming exhibition entitled From Assyria to Iberia: Crossing Continents at the Dawn of the Classical Age, set to open September 22nd. The animation is planned to play life-size giving visitors an immersive sense of what it was like to experience the magnificent palace. creating a new type of online, interactive, globally accessible archeological publication. August 29, 2013 -- Learning Sites has just been awarded a prestigious NSF SBIR Phase II grant for a project entitled Extracting Valuable Information Automatically from Objects with Surface Impressions via Photographs and Interactive Digital Surrogates. This Small Business Innovation Research Phase II project will complete toward commercialization the proof-of-concept Cuneiform Automated Translator (CUNAT) system developed in Phase I, which included advances in photo-modeling, surface segmentation, geometric character recognition, interactive 3D model viewing and manipulation, ancient language translation, mobile-device application development, and rules-based engine logic. CUNAT demonstrated that the proposed approach could have significant impact on a discipline focused on slower manual methods. This SBIR Phase II project will expand the system to address critical needs across the field of archaeology and to produce a commercially viable product suite with applications to problems in museum exhibition, forensics, paleontology, numismatics, digital art history, and beyond. Ancient Mesopotamian legal treatises, Egyptian medical records, and Roman political accounts--telling us exactly what happened in the words of the very people whose actions formed our history--languish untranslated, because there are too many of them, translation takes too long, and there are too few linguistic experts. “Cuneiform text genres include everything...from mathematical and grammatical exercises, beer recipes, international treaties, musical scores, legal codes, religious rituals, sales receipts, and astronomical tables....[M]useums...have acquired approximately 400,000 tablets, with thousands being unearthed every year.... [S]cholars continue to make unique and valuable contributions to the study of history, law, religion, linguistics, mathematics, and science” (Digital Hammurabi Project). CUNAT will allow anyone to create 3D models of such artifacts and automatically extract meaning from their impressions more effectively and quickly than existing tools. Imagine a high-school student entering an art museum and seeing an object with triangular-shaped surface incisions. The label reads: “cuneiform tablet, 864BCE, Nimrud.” Curious, the student aims a smartphone camera at the object and clicks. The images are uploaded into the CUNAT app, which generates an interactive 3D model and an English translation of the inscription. The student may be the first person to have read the text and discover previously unknown astronomical knowledge detailed by the ancient scribe. CUNAT gives this research power and excitement of discovery to everyone, every institution, anywhere, anytime, because neither expensive special equipment nor complex calibration or lighting are necessary to produce results with unprecedented efficiency and accuracy. January 30, 2013 (March 20, 2013; and May 23, 2013) -- Continuing a news item from late last year, Time Magazine online has picked up the story of Learning Sites photomodeling project with the Semitic Museum at Harvard, as has Popular Mechanics, and Dezeen. 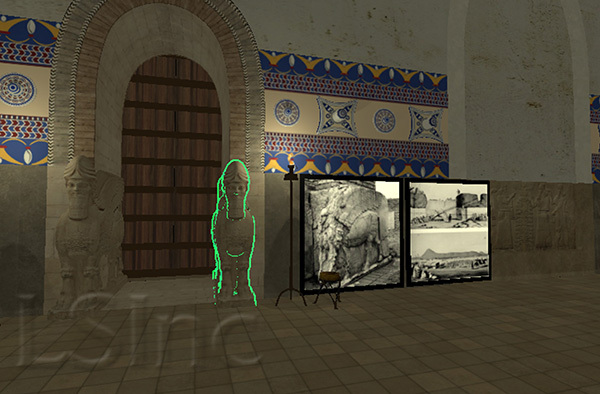 December 4, 2012 -- Learning Sites innovative photomodeling techniques are being applied by Harvard University's Semitic Museum to study broken sculptures from the ancient site of Nuzi (in modern-day Iraq). The Harvard Gazette has just published an article detailing the collaboration. Our new techniques allow museums to obtain high-resolution 3D computer models without the need for expensive laser scanners, without elaborate lighting, and without having to remove the objects from the museum or even its galleries. When combined with CNC printing, the process opens whole new avenues of research and types of museum display solutions. Additional information can be found on the Semitic Museum Website. 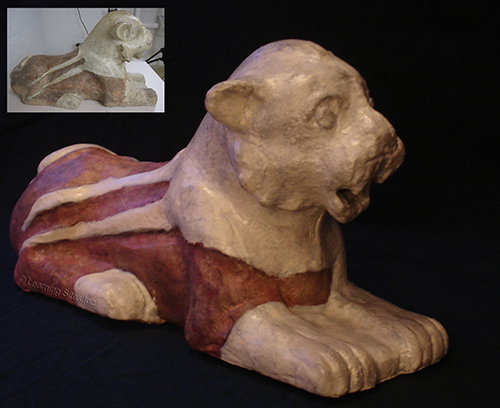 The image below shows an inset of the original lion and our carved copy. On Dec. 10, the story was picked up and expanded by Wired.com and on Dec. 11 by the Art World Daily (and see Jan. 30, 2013, above) Or you can simply type in "Semitic Museum" and "3D" into your favorite search engine and read about the story in dozens of online sources all over the world or read about it right here !! How can we help your museum ? November 8, 2012 -- Donald H. Sanders, president of Learning Sites, will be giving the AIA lecture at Princeton University on this date. His topic will be: An Assyrian Palace: How Virtual Reality is Changing How We Understand the Past. The lecture will take place at 5pm at 106 McCormick Hall, Princeton University. May 28, 2012 -- Learning Sites has just been awarded a National Science Foundation (NSF) Small Business Innovation Research (SBIR) Phase I grant (#IIP-1215308) to create new software for automatically creating textured, 3D digital models of the impressions on cuneiform tablets and other objects from multiple digital photographs and for automatically performing geometric character recognition on the impressions in order to derive meaning. The proposed system, which will be more accurate, faster, and a more effective detective tool than any current alternative, comprises: (1) reconstructing detailed models of cuneiform tablets from multiple photographs; (2) isolating individual cuneiform strokes and distinguishing meaningful characters from background cracks; (3) classifying, against lexicons, the characters based on geometric characteristics; and (4) performing preliminary automatic word identification leading to translation of the texts. The grant is entitled Extracting Valuable Information Automatically from Objects with Surface Impressions via Photographs and Interactive Digital Surrogates and will be performed in partnership with Brown University. June 17, 2011 -- We are pleased to announce that a License Agreement has been signed between Learning Sites and MellaniuM (www.mellanium.co.uk) with the purpose of importing one of Learning Sites virtual worlds into the web.alive / Unreal platform for eventual immersive global collaborations. The first Learning Sites virtual world to make the transition will be the Vari House (a 4th c. BCE Hellenistic beekeeper's house in Attica, Greece). The Vari House was excavated in the 1960s, and the 3D computer models developed by Learning Sites became a pioneering virtual world for interactive education in the late-1990s. It seemed appropriate that this well-known package become the first test case of the new partnership. Learning Sites has been an international leader in innovative digitally reconstructed ancient worlds for interactive education, research, museum display, broadcast, tourism, and publication. With a feature set designed originally for the enterprise, web.alive is a web browser plug-in that integrates with an existing network, security, and business applications to enhance communications, collaboration, and employee or consumer engagement. In this way, web.alive minimizes operational overhead, dramatically increases accessibility to users, and delivers face-to-face interaction at the low cost of Web collaboration. Avaya web.alive represents the future of communications and offers the best of publicly and privately accessible immersive Web conferencing. MellaniuM has leveraged this platform to produce unique and innovative environments scaled to up to 10km square containing very high-polygon models. These environments can be developed either from existing 3D mesh models compiled from 3D modeling packages or from geo-referenced terrain maps using the latest UAV scanning techniques. For example, it is entirely possible to create accurately scaled simulations of long-gone masterpieces of the Industrial Revolution or entire archaeological sites, as we hope this partnership will demonstrate. Keep watching our two Websites for updates about and invitations for joining in the Vari web.alive experience. January 26, 2011 -- Learning Sites has installed an animated flythrough and a virtual reality workstation in the galleries of the Williams College Museum of Art (Williamstown, Massachusetts); each installation uses the latest Learning Sites 3D computer model of the Northwest Palace of King Ashur-nasir-pal II at Nimrud, Assyria (present-day Iraq). The installations are for a new show called A Collection of Histories. The show uses the Williams College Museum of Art’s two Assyrian reliefs as case studies for how works of art accumulate collections of histories over time. The reliefs, the first to come to America from ancient Assyria, arrived on the Williams College campus in 1851. By unfolding the layers of history, we can examine the significance of context in shaping meaning and confront an essential question: Who owns the past? This exhibition is part of the museum’s innovative reinstallation project entitled Reflections on a Museum. All of the exhibitions in this project take “the museum” as their subject, exploring everything from the role of a curator to what makes something a work of art. The show will run for two years beginning on February 3, 2011. 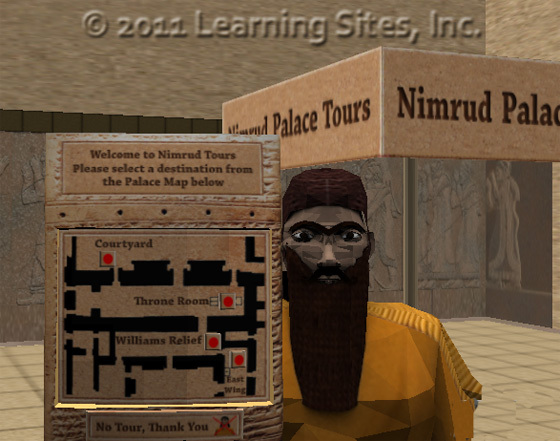 The virtual reality package is the first Learning Sites' world to include a virtual tourguide who, upon request, will lead viewers to points of interest in and around the Northwest Palace (see the screen grab below). En route, the guide explains what is passing by. Once at a destination, users can access context-specific descriptions, photos, drawings, and 3D models. June 17, 2010 -- The conference entitled ARQUEOLÓGICA 2.0 will analyze both the present and future of digital reconstruction and computer-aided rendering techniques as applied to archaeological heritage and culture. The conference's goal is to offer an updated overview about archaeology in the 21st century, with special emphasis on: research and development in virtual archaeology, planned projects, new rendering techniques, development of new methodologies, and the cooperation of professionals from different fields, in order to encourage an exchange of both knowledge and experience. Donald Sanders, president of Learning Sites, will speak about "Enabling Archaeological Hypothesis Testing in Real Time using the REVEAL Documentation and Display System." April 22, 2010 -- The Archaeology and Architectural Committees of the National Arts Club present Dr. Donald H. Sanders, president of Learning Sites, Inc. He will discuss a few of the difficult archaeological sites his company has re-created such as the Northwest Palace of Ashur-nasir-pal II at Nimrud in ancient Assyria, the Old Athena Temple from the Acropolis, and the Actium victory monument at Nikopolis erected by Octavian prior to his being granted the supreme title Augustus. Understanding history isn't simple; we weren't there. Additionally, history didn't occur in two dimensions; so why study it only through photographs and drawings? 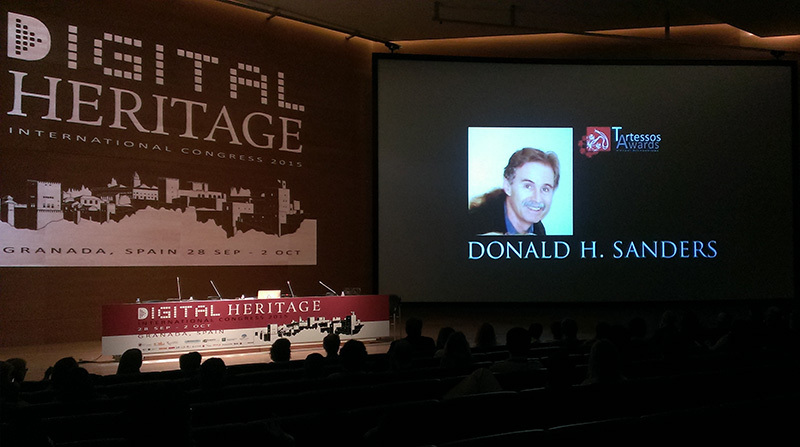 Virtual Heritage, pioneered some fifteen years back by archaeologist-architect Donald Sanders, amongst other professionals, developed as an alternative by building computer-generated, interactive, three-dimensional models of ancient settings, events, and cultures. Earlier, illustrated volumes and instructural audiovisual materials educated. Twenty-first century's sophisticated digital techniques including virtual reality offer entertaining worlds that allow us to experience visually a richly dynamic world. Thus, a reconstructed past emerges in the present, offering fuller insight into its unique period, guiding us to live better in our own times. August 31, 2009 -- Learning Sites Inc. has been selected for the 2009 Best of Business Award in the Computer Graphics category by the Small Business Commerce Association (SBCA). March 3, 2009 -- The American Turkish Society presents a film screening and discussion at Temple Emanu-El, New York City (beginning at 6pm), of Queen of the Mountain and Theresa Goell's work in Turkey (especially at the mountain-top sanctuary of Nemrud Dagi). Martha Goell Lubell (producer and director of the film) and Donald H. Sanders, President, Learning Sites, Inc. will speak and be available for questions. Space is limited and reservations are required. Download or open the .pdf file for additonal contact and sign-up information (Adobe Acrobat Reader required to open the .pdf file). October 18, 2006 -- The Hood Museum of Art at Dartmouth College (Hanover, NH) has opened two new installations created by Learning Sites expressly for their latest exhibition and symposium entitled From Discovery to Dartmouth: The Assyrian Reliefs at the Hood Museum of Art, 1856-2006. The museum's collection includes six large reliefs from the Northwest Palace, Nimrud (ancient Assyria, now Iraq). Learning Sites developed a 6-minute animated flythrough of the Palace featuring the Hood's reliefs in simulations of their original locations, as well as a virtual reality module that allows users to explore the Palace, view linked photographs of the excavation, and read background text about the site and the sculptures. Both installations were created specifically to place the Hood's reliefs into digital surrogates of their original contexts in order to elucidate their functions within the Palace's overall sculptural program. In conjunction with the exhibit, a 2-day symposium (November 3-4, 2006) sponsored by the museum is bringing in noted scholars in Assyrian art and archaeology to discuss the significance of the Palace and its decoration. The animation has been installed in the gallery next to the reliefs where it continues to enthrall visitors. March 15, 2006 -- The competitive results are now available for The Archaeology Channel International Film and Video Festival, held last week at Eugene's McDonald Theatre, Eugene, Oregon (USA). The Festival, which took place March 7-11, featured many of the world's best films and videos on archaeology and indigenous peoples, as well as an in-person presentation (“Chaco Canyon: America's Stonehenge”) by leading author and archaeologist Dr. Brian Fagan. Producers and distributors from 15 countries worldwide submitted 56 film entries to the Festival, of which 17 films from 7 countries were screened in front of the McDonald Theatre audience. Awards listed below are in three categories: Best Film (by jury), Best Use of Animation (by jury), and Audience Favorite, as well as a Special Mention Award designated by the Festival jury. Both top awards (Best Film by Jury and the Audience Favorite Award) went to the American film Queen of the Mountain, a film biography about Theresa Goell, a woman in a man's field who, at the age of 50 in the 1950s, achieved her lifelong dream of excavating the mountain-top archaeological site of Nemrud Dagi in southeastern Turkey. This film was produced by Theresa Goell's granddaughter, Martha Goell Lubell and distributed by Women Make Movies. 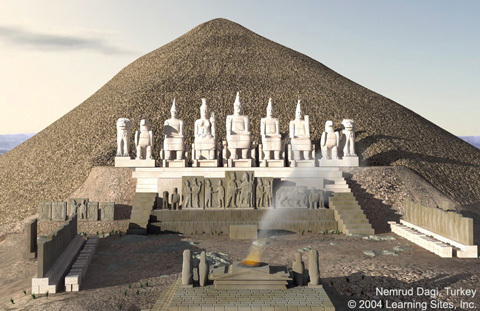 The film features several digital reconstructions of the site of Nemrud Dagi prepared by Learning Sites, Inc. The film also has Learning Sites' president, Donald H. Sanders (who published the final excavation report on the site), speaking about the history of the site and Theresa Goell's exploits. See our Webpages about Nemrud Dagi to see some of the visuals and read about where the film will next be screened (sample rendering below). November 9-13, 2005 -- Donald H. Sanders, Ph.D., president of Learning Sites, has been invited to participate in a Workshop on Digital Archaeology in Mussoorie, India. 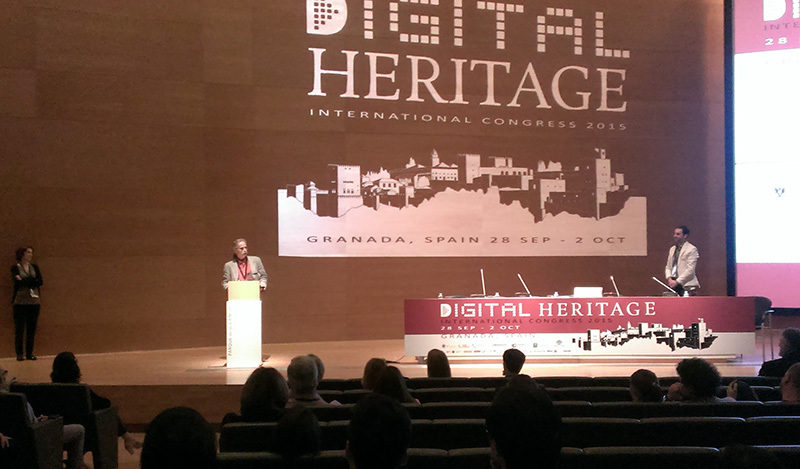 Dr. Sanders will be speaking about his decade of pioneering work in the field now called Virtual Heritage. The Workshop has been organized by the Indo-US Science and Technology Forum to provide an opportunity for discussion between selected American and Indian practitioners on various aspects of the use of computer technologies in archaeology. As we proceed forward through the 21st century, archaeologists will have to reorient their methodologies and approaches to incorporate emerging digital technologies, despite the challenges that these new computer-based data-collection and visualization tools bring to the discipline. The advantages of digital image capture, data mining, geospatial positioning, virtual reality, and electronic data transfer technologies are great and expanding. Digital archaeology is now a rapidly growing field within cultural historical studies with multidisciplinary and multinational partnerships spawing new avenues of research. This Workshop will explore many of these new pathways and their potential. April 13-17, 2004 -- Donald H. Sanders, Ph.D., president of Learning Sites, has been invited to speak and chair a session at the Computer Applications and Quantitative Methods in Archaeology (CAA) conference in Prato, Italy. His session will focus on "Virtual Reconstructions in Archaeology," and offer an international array of speakers on a wide range of current topics in Virtual Heritage. December 3-4, 2003 -- Donald H. Sanders, Ph.D., president of Learning Sites, has been invited to speak on the importance of cultural heritage protection and preservation at the 2nd Rebuilding Iraq Conference. Members of the Iraqi Governing Council, the Coalition Provisional Authority (CPA), major companies and foundations, as well as several panels of Iraqi and international experts will unveil a comprehensive plan to accelerate reconstruction and mobilize free trade throughout Iraq. Sanders will be representing the discipline of Virtual Heritage and a consortium of hardware and software partners organizing to create a massive digital library of all Iraqi heritage information to serve as a resource for all parties interested in the redevelopment of the country. December 3, 2003-- Group TF-1, France (First Channel) television will air another program in their "Ushuaïa Nature" series. Program #22, entitled Sudan will feature visualizations from the Learning Sites digital re-creation of the ancient Nubian religious center of Gebel Barkal. November 12, 2003 -- Learning Sites has entered into a licensing agreement with the Institute for the Visualization of History, to provide them with content to be repurposed and expanded for their educational mission. The Institute is a unique noncommercial, nonprofit, 501(c)(3)-registered educational organization focusing on innovative methods of presenting historic monuments, sites, and events through vivid visual experiences, especially by means of advanced computer graphics. It intends to reach the widest possible public both as a developer of educational materials and as a museum. July 6, 2003-- MSNBC will air (at 8pm Eastern time) a National Geographic Television special entitled Iraq's Lost Antiquities about the ongoing destruction and looting at ancient sites throughout Iraq. 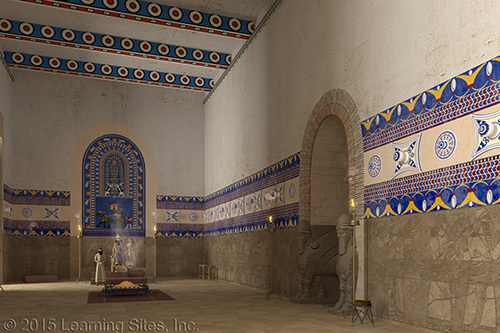 The program will include a special computer-generated walk-through of the Northwest Palace at Nimrud created by Learning Sites showing how the Palace might once have appeared when in use by the Assyrians (see sample rendering below). This view will contrast with the current state of the building and on-going destruction of the wall reliefs at the Palace due to gun battles and attempts to steal fragments of the reliefs for sale on the illegal antiquities market. May 21, 2003 -- France3 public television will be broadcasting a program entitled Des racines et des Ailes about the history of the Acropolis, which will include a flyover created by Learning Sites, from our 3D computer model of the site as it may have appeared in the late 5th century BCE. The program should be repeated a few days later on France TV5 by satellite all over the world. 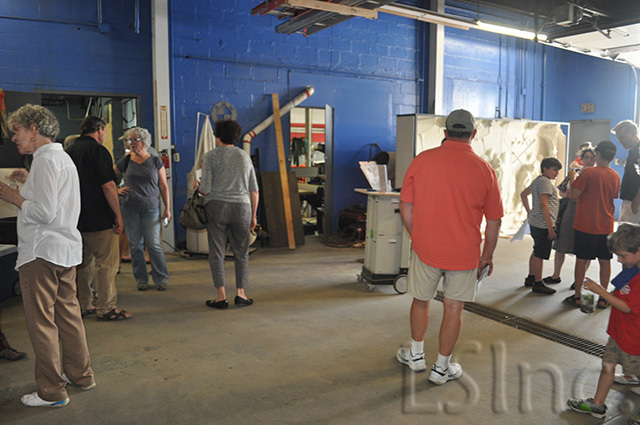 Further information can be found at the studio's Website once the program airs. March 8-9, 2003 -- CNN-International and CNN-Headline News Network are broadcasting a short story (at various times throughout the weekend) about Learning Sites' 3D computer model of the Northwest Palace, Nimrud (in Iraq) and threatened antiquities should war breakout. October 15, 2002 -- Discovery Channel TV, Canada, broadcast a story about the possibility of war looming over Iraq. The war threatens more than Iraq's future. It threatens its past. The story reviewed the efforts of a team of ancient art scholars, programmers, and scientists at the University at Buffalo (New York, USA) to learn and teach about Iraq's distant past using Learning Sites' 3D computer model of the Northwest Palace at Nimrud. Part of the story and a short video are available at the Discovery Channel Website. May 2, 2002 -- Learning Sites and the field of virtual archaeology are featured in today's Circuits section of the New York Times. The article reviews some current projects and the impact that interactive graphics technologies are having on the field of archaeology. Individuals who now comprise Learning Sites were the pioneers (back in 1994) in the approach now known worldwide as "virtual archaeology." March 25, 2002 -- Donald H. Sanders, Ph.D., President of Learning Sites, Inc., was invited back as a speaker at the European Union-sponsored EUR0-CHER II Conference (a follow-up meeting to the December 2001, Chania, Crete, sessions -- see below) also entitled "Advancing Archaeological Sites: exploring technology and the theme park experience" held in Thessaloniki, Greece, on March 14-15, 2002. Sanders discussed how contemporary 3D computer graphics technologies can enhance the storytelling experience visitors' can get at archaeological sites. The conference brought together specialists in computer graphics, theme-park design, law, government, landscape design, and virtual reality. December 1, 2001 -- Donald H. Sanders, Ph.D., President of Learning Sites, Inc., has been invited to be a featured speaker at the European Union-sponsored EUREKA Conference entitled "Advancing Archaeological Sites: exploring technology and the theme park experience" to be held in Chania, Crete, on December 13-14, 2001. 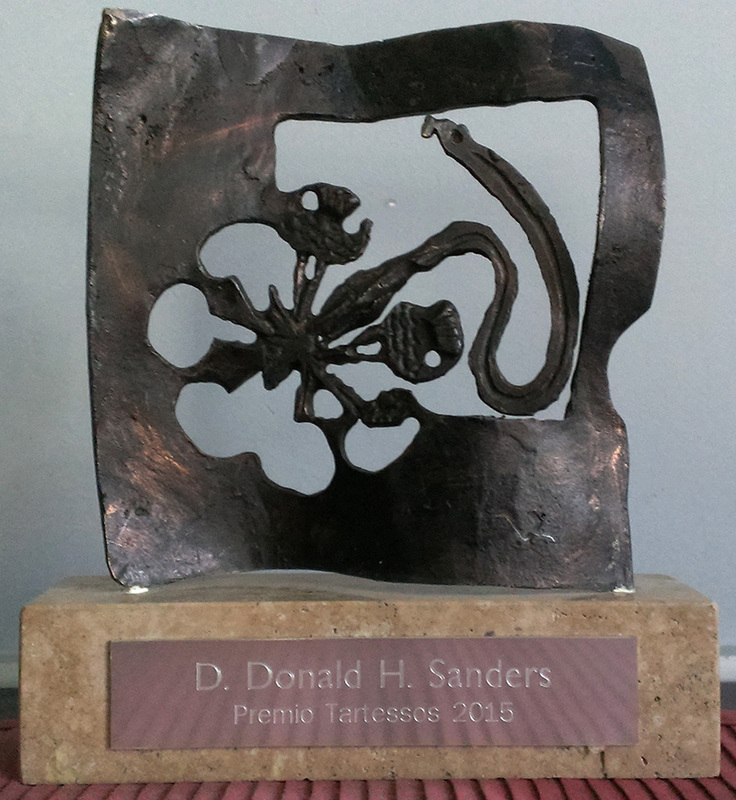 Sanders will address the challenges and opportunities presented by contemporary computer technologies for improving the attractiveness of European archaeological sites to visitors. He will present the latest innovations in the new field of virtual heritage (the use of interactive 3D computer graphics, including virtual reality, for the collection, study, visualization, and publication of cultural heritage information), a field pioneered by Learning Sites in the mid-1990s (a copy of the talk is available here for review). September 12, 2001 -- Read more about the collaborative work being undertaken between Learning Sites and the University at Buffalo (State University of New York) in an online article published by the Chronicle of Higher Education. May 23 and 24, 2001 - History Channel -- documentary entitled the Hidden Tomb of Antiochus, about the site of Nemrud Dagi featuring an interview with Donald H. Sanders, President of Learning Sites and visualizations of the site created by Learning Sites especially for the broadcast. Mar. 27, 2001 - VARA, Dutch Public Broadcasting -- their television show called De Ontdekking (Discovery) presented a documentary about new technologies in archaeology, featuring interviews with Donald H. Sanders, President of Learning Sites, visualizations of ancient worlds created by Learning Sites, and innovative blue-screen interviews inside two of Learning Sites' virtual worlds. To view the program online, go to: http://www.omroep.nl/vara/ontdekking/ and then click on 'digitaal' in the upper right corner; then click on 'verleden van de toekomst' just below; this will open a new window; once this opens, click on 'kijken', then 'video' and finally 'start' to begin the video segment. Feb. 20, 2001- Turkish Public Television -- documentary entitled Mount Nemrud: the throne of the gods, by Ekip Film, Ltd. of Istanbul, featuring interviews with Donald H. Sanders, president of Learning Sites and a 3D computer re-creation of the 1st-century BCE sanctuary site. Jan. 2001 - CNN-TURK, interview with Donald H. Sanders, President of Learning Sites, concerning the site of Nemrud Dagi, Turkey, its history, current deterioration, and prospects for preserving the site for future visitors and scholars. March 15, 2001 -- The Virtual Heritage Network (VHN), the leading coordinator of activities, information, and conferences about the expanding community interested in virtual reality re-creations of our global cultural heritage, has featured a story about Learning Sites on the VHN Website's homepage. The cover story highlights the history of Learning Sites, its goals, its vision for virtual-reality-based archaeology and education, and some of its current projects. November 14, 2000 -- Donald H. Sanders, Ph.D., President of Learning Sites, Inc., has been chosen as a keynote speaker for the upcoming VAST - Euroconference on Virtual Archaeology, to be held November 24-25, 2000, in Arezzo, Tuscany, Italy. Although entirely funded and normally attended by members of European Community countries, an exception was made with the consent of the European Commission in order to invite Dr. Sanders, because, in the words of the conference organizers, "[Sanders is] an internationally recognized expert in the topic concerned giving a substantial contribution to the conference success." Dr. Sanders will expand on a theme he presented recently in Japan regarding the paucity of virtual reality-based exhibits in museums with collections cultural heritage artifacts, such as art and archaeology museums, archaeological site museums, and local history museums. Noting the increasing usage around the world of wireless digital technologies, Dr. Sanders believes it's time that museums take advantage of new methods for providing each visitor independently and directly with interactive text, sound, and 2D and 3D image information for each object on display. Building on other recent conference invitations and contracts (with the government of Sicily, Italy, for a virtual reality model of a newly discovered ancient Greek dining hall complex or hestiaterion; with the Williams College Museum of Art, Williamstown, MA, USA, for a detailed computer fly-through of the Northwest Palace of Ashur-nasir-pal II, Nimrud, Assyria, for that museum's upcoming 75th anniversary celebrations; and with the Dalton School in New York City to create innovative virtual-reality-based educational materials), Learning Sites continues to lead the newly emerging field of virtual cultural heritage--creating innovative interactive 3D computer models of ancient and other historical settlements, buildings, and artifacts, for museums, site interpretation centers, television programs, teaching materials, and scholarly publications. September 15, 2000 -- Donald H. Sanders, Ph.D., President of Learning Sites, Inc., of Williamstown, has been chosen as "The Invited Speaker on Virtual Heritage" at the 6th International Conference of the International Society on Virtual Systems and MultiMedia, October 4-6, 2000, at the Softopia complex, Gifu, Japan. Dr. Sanders will speak on the integration of virtual reality-based computer displays into museum galleries. The presentation will be a summary of past and current uses of virtual reality in science and technology museums and the curious lack of its use in art and history museums. Several roundtable meetings will follow at which Sanders will participate with museum personnel, artificial intelligence specialists, and other virtual heritage content providers in discussions about future plans of action to bring the museum and virtual heritage communities closer together. Proponents believe that such collaboration will benefit the visiting public by helping them to visualize and understand, through interactive computer displays, how past cultures used and created the objects now in the museums' collections. In recent years Learning Sites has been at the forefront of the fast-growing field of virtual cultural heritage--creating interactive 3D computer models of ancient and other historical settlements, buildings, and artifacts, for museums, site interpretation centers, television programs, teaching materials, and scholarly publications. July 5, 2000 -- LEARNING SITES, Inc., of Williamstown, Massachusetts, USA, is pleased to announce that it has been awarded the contract to create a three-dimensional computer model of the Hellenistic sanctuary of Nemrud Dagi (Turkey, 1st century BCE) for inclusion in a television documentary. The program will cover the history of the sanctuary, the king who commissioned it, and the American excavator who braved climatic, economic, and logistical hardships to unravel the mysteries of the site, where colossal sculptures ring a central mound set atop the highest mountain (c.7000 ft.) in southeastern Turkey. Filming for the program, by the Turkish company Ekip Film, Istanbul, begins this summer and will include animated flyovers of Learning Sites' digital model as well as live historical re-enactments of battles waged by the king against the invading Romans. April 20, 2000 -- In 1998, LEARNING SITES, Inc., (Williamstown, Massachusetts, USA), an internationally recognized leader in the creation of accurate and detailed, interactive 3D visualizations of the ancient world, co-sponsored a series of special sessions on virtual reality at the Computer Applications and Quantitative Methods in Archaeology conference in Barcelona, Spain. One result of those sessions was the founding by Learning Sites of the Virtual Worlds in Archaeology Initiative, an international clearinghouse dedicated to sharing information about, visualizations from, and techniques for the many virtual ancient worlds being built around the globe. A second result of the sessions is the publication of a comprehensive "state-of-the-discipline" book and CD-ROM elaborating on the papers and projects presented in Barcelona: Virtual Reality in Archaeology, co-edited by Juan A. Barceló (Universitat Autónoma de Barcelona, Spain), Maurizio Forte (Institute of Technology Applied to Cultural Heritage, Rome,Italy), and Donald H. Sanders (president of Learning Sites, Inc.). January 1, 2000 -- LEARNING SITES, Inc. is pleased to announce that it has been chosen as a partner in the development of educational materials based on the ancient kingdom of Nubia (present-day Sudan). Funded by a National Science Foundation grant, the Education Development Center (EDC, Newton, Massachusetts, USA) will embark on a three-year project entitled The Science, Mathematics, Engineering, and Technology of Discovery: Unlocking the Secrets of Nubian Culture. 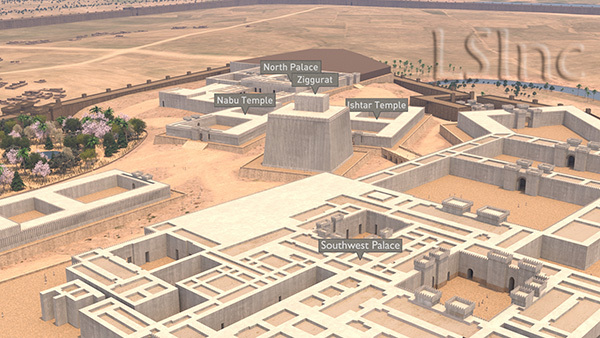 Learning Sites will produce virtual reality models of ancient Nubian sites for the project intended to enable students of all ages to learn by exploring re-creations of Nubian temples, palaces, pyramids, and settlements. update June 26, 2002 -- Our participation in the EDC project has taken a different turn. LEARNING SITES will be developing an excavation simulation game for their traveling, Web, and education package called digNubia!. The game should become available early in 2003. December 10, 1999 -- LEARNING SITES' virtual reality re-creation of the 9th-century BCE Northwest Palace of Ashur-nasir-pal II at Nimrud, Assyria, was chosen by the Metropolitan Museum of Art, New York City, as the basis for the redesign of its Assyrian galleries, which displays one of the world's premier collections of sculpture from that Palace. Newly added features to the Gallery include ceiling beams over the main space to simulate the Palace's Throne Room; the beams were based on research and computer models by Learning Sites. More decorative elements and details will follow, also guided by our visualizations, which have corrected century-and-a-half-old misconceptions about the size, construction, and decoration of the Throne Room.